Intaki Prime is a jewel among planets. It is tropical and filled with diverse life forms. We have lived and grown on this planet for time beyond measure. I was born in the town of Asaya, sitting at the base of the Akat mountain range. These mountains mark the southern end of the habitable region of the north pole. My town was hidden from the harsh sunlight in the deep valleys that intersect the mountain range. 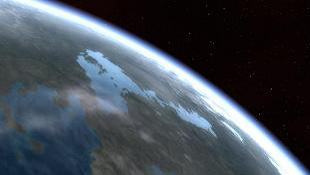 Intaki Prime is a very hot world, and both polar regions were once thick with tropical forests. The equatorial oceans are exceedingly hot, and few living things survive around the equator. The rich and varied life of Intaki Prime has been confined to the polar regions, and in constant struggle for land, food, and shelter from the environment. This is important—for our very culture was developed here, on a planet in a constant state of competition for limited resources. We came to realize that the universe is a harsh place, and people need to survive. We never reached the heights of technology that, say, the Gallente or Caldari did, but we developed a culture able to deal easily with great stress and uncertainty. We learnt that the best way to survive was to work with the environment, not to fight it. This is reflected by our architecture and constructions, which are usually made of natural substances such as wood and stone, or made to emulate their form. This design philosophy has actually proven quite popular in the Federation.